When I feel that I can’t find any inspiration I take up my knitting and watch TV. My wool sweater has grown during August. The balls of yarn is shrinking. The knitting basket is always put away after a knitting session, because my cat likes to eat yarn. She curls up in my lap when I knit so that my lap is filled with cat hair, yarn, knitting needles, my quilted blanket and her soft purring sounds. I savour these moments in time when she shares her warm fur with me while I slowly knit and purl away on a garment I hope I will like and wear. I hope this cardigan will be the kind of sweater that you can use for many years. Comfortable, big, warm and homemade. They look like they belong together (with me). Both have blank plain pages and are ready to be filled with sparkly ihanna-ness. Sparkle girl, sparkle? 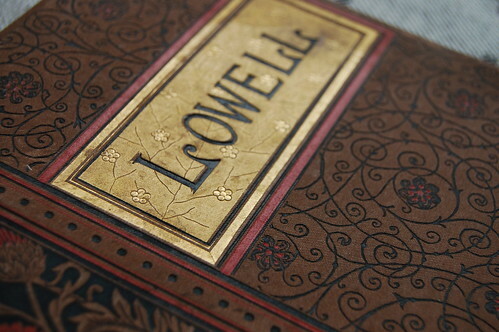 The Lowell book is for collages and colours, filled with sturdy white pages and bound by Kira. It is a coptic bound journal made with a vintage book cover, the inscription inside had the date of Christmas 1892 according to Kira. I think I will make a book like this myself next time, with watercolur paper that I prefer to work on now. But I couldn’t resist this one because the cover is just so beautiful; vintage, swirly and just meant to come and live with me, don’t you think? I’m still considering what to glue in there. I don’t want it to be a ordinary art journal. I think I need a theme, any ideas? When my Moleskine diary was filled I stumbled upon this in mom’s stash. She bought it from the anthroposophs in Järna for 120 sek. I asked if she wanted me to have it, and she agreed. I’m such a lucky girl. I had another notebook in line next but it has lines, and I much prefer plain blank pages if I can get it. Plus the other one (it’s a pink silk one) is now packed away in a box in my storage room. I have no idea exactly where it is, but I’m sure it will be filled too, eventually. 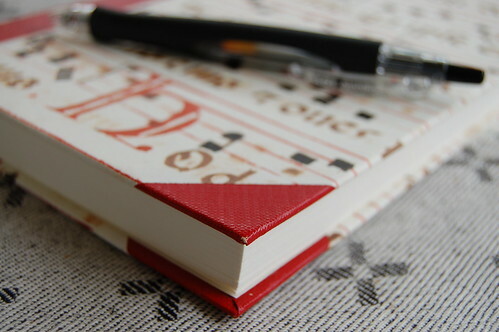 I’ve already started to write in the new one. Do you see the H on the cover? It stands for Hanna of course! And even though I don’t have much happening in my life right now I enjoy my new diary, my knitting and a few TV shows. This entry was posted in Crafts, Notebooks and tagged diary, everyday life, knitting, new notebook, smilla. Bookmark the permalink. What pretty books! Maybe you could do a vintage type theme with the darker covered one or you could do a Christmas one even. 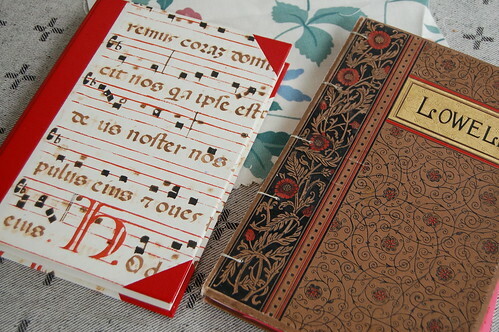 I have seen people do sort of Altered Journal Scrapooks for Christmas and since it was given? For Christmas in the 1800s then it kinda goes. Whatever you do with them I am sure they will be happy! Den ?r s? sjukt fin!!! I love it! oh … it is so time to pull out my knitting, i picked up a beautiful vintage hat knitting book at a thrift store over my summer holidays and am itching to try out some of the patterns :) i love a new fresh empty book, so full of possibilities ~ yay you!! 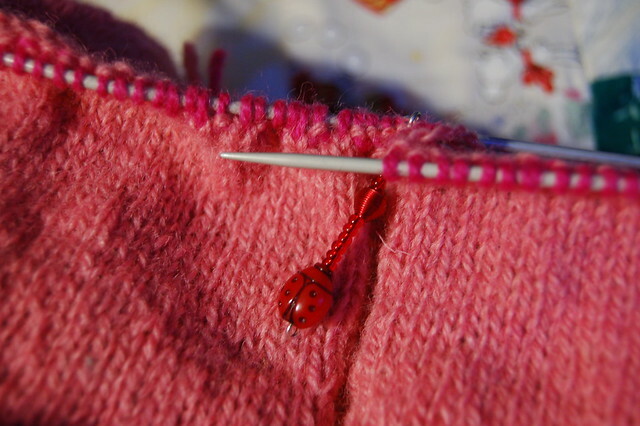 I love the ladybug stitch marker, it is adorable! Good score on the journals. What about making a a dream journal? You could paint, draw, color, collage and write your dreams. Just a thought. 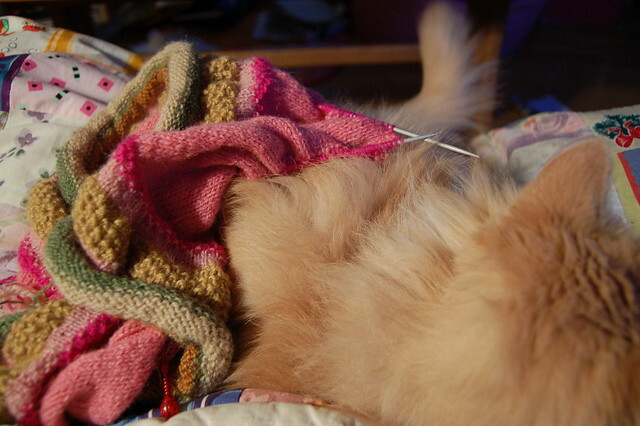 Kitties and knitting. Sounds like the perfect combo.